Sounds simple. Through working with ACT, Ian Tomlinson has learnt what a powerful model it is to treat issues like anxiety, depression, intrusive thoughts, stress, anger, relationship issues and OCD. The course will also discuss how to connect with these components and bring them into your own life and work. Ian will describe a simple model that brings all the components of ACT together in one, easy to understand diagram. The course will be taught with a combination of discussion, group work and experiential learning. There will be plenty of opportunities to explore how the theory fits with your life and how you can apply it in context. What qualifications will I need to attend the course? None. If you have heard about ACT and want to learn more this course is a great place to start. You might want to learn about a different way of thinking about life because you have felt frustrated and stuck. You might be a counsellor or therapist who has heard about the model and wants to know more and experience it yourself. If you work with people or want a rich fulfilling life then this course is for you. Ian will keep the technical jargon out and explain the theory in simple (but not simplistic) language. The course will be delivered by Ian Tomlinson PTSTA(P), the director of The Affinity Centre. Ian incorporates ACT into all his client work with individuals and couples. He is a UKCP registered Certified Transactional Analyst Psychotherapist and has two decades of teaching experience. Ian combines TA and ACT effectively to provide a clear direction for his clients towards leading a rich fulfilling life. Ian has trained in ACT extensively in London and has weekly ACT supervision to support his development in the model. He has seen the huge, rapid impact it can have on clients who feel ‘stuck’ and has experienced the impact that ACT has for himself. "I found the ACT course inspiring, enlightening and extremely useful both personally and professionally. I went on the course two weeks ago and I have already successfully used the principles within my counselling practice and in my personal life. Thank you so much." "Ian Tomlinson is to be highly commended in his deliverance of ACT basic training. I found the course informative and it was delivered in a warm friendly manner by Ian. I have had positive feedback from clients when integrating the skills learned into my practice." "Ian’s two-day ACT course was better than I could have hoped for. Ian has a way of delivering the material that makes it easy to understand and I found him to be knowledgeable friendly and approachable. 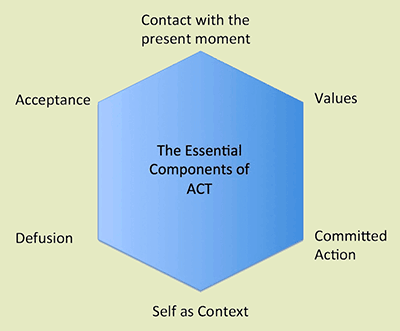 I have already started to use ACT in my therapy practice with great results. Thanks Ian!" "Thank you Ian for another very interesting and informative course. I have found ACT useful already and have introduced it within the existential work I do with some clients. I think the two go well together." "Ian’s ACT training was engaging and professionally delivered, with comprehensive notes I believe it is a vital part of our work as therapists to remain curious about and explore different ways of working. Whether that gives us a new way of looking at or working with our clients, or ourselves. This was a stimulating and enjoyable course." "I thoroughly enjoyed my two days training with Ian. His presentation style is relaxed and clear, and the ACT model very understandable. I found ACT theory was very easy to overlay onto my usual model of TA, and it gave me some great new ideas to integrate into my work. Overall, an excellent workshop." "If you are looking to expand your skills and knowledge as a therapist and you would like to take some time out using mindfulness, I would highly recommend this course. It was well delivered with a variety of theory, practice and personal development. Within 3 days of attending the course I have already started to use some of the knowledge gained for my personal development, in my private practice and with a supervisee. Brilliant Ian and thank you." "Ian is a great trainer. A good mix of humour, exercises and theory. A very engaging course, relaxed and enjoyable." "Really enjoyed learning with Ian, great facilitator. Looking forward to returning at some point in the future." "I found the Introduction to ACT course very effective. Ian was clear and engaging." "I found the course was really helpful at developing my knowledge of ACT. Ian has a great, engaging delivery style that helps make the information accessible. Great balance of theory and practice, plus good use of learning aids." "I think what was done in the two days would be hard to improve on." "Thank you Ian - I've found the two days really enjoyable. A great blend of theory and practice, really well paced and explained. Felt comfortable and able to integrate ACT for both me and clients." "Ian was an excellent facilitator. Clearly very knowledgable, but not intimidating with it. Calm pleasant and approachable.He made the course content accessible and easy to understand, even though I had never done anything with ACT before. Would definitely recommend." "Really informative, well taught and very well structured." "A good comprehensive introduction to ACT that encourages you to want to learn more." "Fantastic - well organised, clear objectives and Ian has a way of putting everyone at ease"
"Very interesting and informative course. Great introduction to ACT with lots of useful ideas that can be integrated into current practice." "Ian delivers the material in a way that is easy to access and understand, with a good use of theoretical framework and practical exercises." "A fantastic introduction to ACT with a perfect combination of theory and opportunities to use the techniques introduced. A refreshing approach which I am looking forward to using in my practice." "Great course and fantastic tools to help people with." "The key concepts of ACT were clearly communicated and demonstrated. There was time and space to ask questions and it felt like a safe environment." "I thoroughly enjoyed this introductory course to ACT. Ian is a great trainer and delivers the material with sensitivity and humour. Lovely comfortable premises. I felt very welcome." By clicking the box above you agree that £100 of your payment is non-refundable and that the total amount is non-refundable from three weeks before the course. Dates of forthcoming training can be found in the adjacent column. Training hours are 9.30am to 4.00pm. Please note that we like to keep the size of the courses small at The Affinity Centre, to allow for a more personal experience where people feel free to share their thoughts. Please book early as courses tend to fill up quickly. If you can’t get on this course you will be offered a place on the next course running. The ACT course costs £200 for two days training. Please complete the form on this page and pay the £100 non-returnable deposit (all payment methods accepted via PayPal). The final £100 will be due two weeks before the commencement of the course and is also non-returnable at this time.